Renfe has tested what it has described as the first passenger train in the world to be powered by liquefied natural gas (LNG). The project has been launched to assess the economic and environmental viability of the fuel source as an alternative to diesel. LNG is part of a strategy of alternative fuels that includes electrification of the railway, hydrail and the use of batteries. As part of the trial run, one of two diesel engines in a Renfe 2600 series train was replaced by one that uses natural gas for its propulsion so that a comparison could be made, the necessary auxiliary elements were also installed. A study will now look at installing LNG engines to a number of trains on the Baíña-Collanzo line in Asturias. 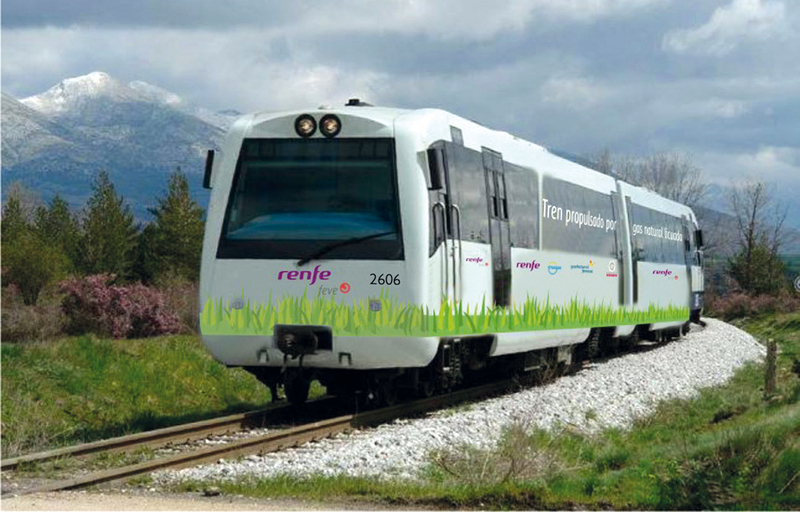 Renfe said that the use of LNG could help to reduce emissions, noise pollution and contribute to lower operating costs. The state-owned operator conducted tests on a 20km stretch of track in Asturias on January 8, with the country’s Minister of Development and Minister for Energy in attendance. Renfe is working together with state-owned infrastructure manager Adif, utility companies Gas Natural Fenosa and Enagás and Bureau Veritas on the project.